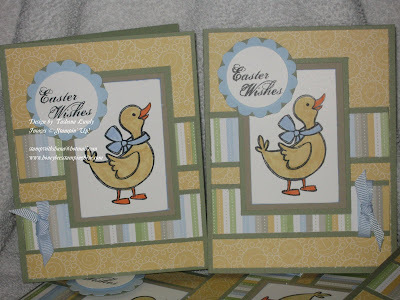 Here are my Easter Cards. I made 60 cards using the same sketch but different colors. I will be sharing all of them this week. For all the cards I used the Newly Retired Sale-A-Brations DSP. The main image is from the Wagon Full of Fun stamp set. You can find that in the Occasions Mini Catalog. 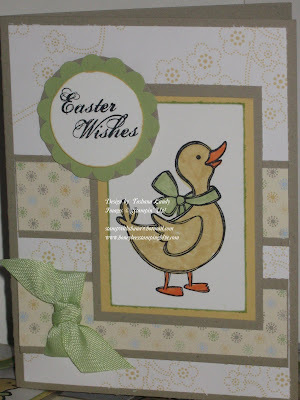 The sentiment is from the All Holidays stamp set. Scallop Circle, 1-3/8 circle, 1-3/4 circle punches; various Stampin' Write markers, Certain Celery Ribbon (SAB), Bashful Blue ribbon; Kraft, So Saffron, Whisper White, Certain Celery, Bashful Blue and Mellow Moss card stock; Black StazOn ink.